Naijaside website redesign is a project we won’t forget in a hurry because it stretched us beyond our limit. Our mission was to satisfy our client no matter what it cost. Even when additional assignments were pushed at us that were not included on the initial web package, we received them gladly just because we wanted to learn new things. It’s indeed a fact that every design project is an opportunity to learn new things and also to discover new set of tools. 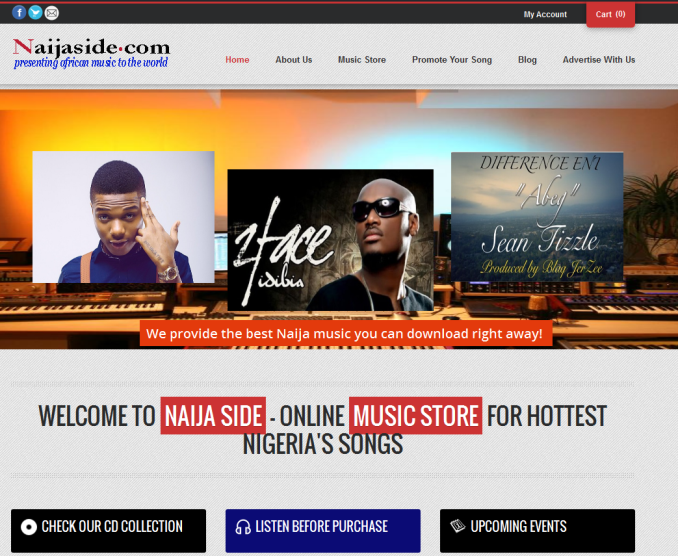 Naijaside is Nigeria’s First online music store. for all the latest and greatest music out of 9ja. Naijaside allows you to buy songs as music lover, sale songs as an artiste, or download songs for free from all your favorite Nigeria/Africa artists. Genres include: Rap, Reggae, R&B, Traditional, Christian Gospel Music, juju, Hip hop, Dance, Blues and native songs. We were commissioned to redesign the site and make it look attractive, functional and user-friendly. We noticed the site has two major structural components- ‘The ecommerce platform and the blog content’. We tried to marry the two platforms on the new design while preserving the intent of both in a way that they complement one another and also boost conversion.